I arrived in New Jersey about three weeks ago. I am living in a town called Lambertville which is about fifty miles from New York City. New Jersey has about nine million residents on .0015% the land size of Siberia. On the other side of the Delaware River, five minutes walk away, is Philadelphia. In this state, it is illegal to talk on a cell phone whilst driving, but motorcyclists don’t have to wear a helmet. What’s up with that? I am still putting up posters of New Zealand poets and thoroughly enjoying it. At Phantom Billstickers, we have a system where a file is sent through to a photocopy shop in Princeton, New Jersey. That same day I can pick up posters. I cannot tell you how much photocopying has revolutionised street posters. The new digital printing of larger posters is doing the same, bringing a fresh immediacy to the media. It’s direct and it’s hard-hitting. Soon after I arrived in Lambertville there was a poetry reading at a local cafe, River Poets Journal. I managed to get a Janet Frame poetry poster and a Geoff Cochrane poetry poster on either side of the podium. Next, I covered the bookshops and music stores in the area. These included Labyrinth Books and Princeton Record Exchange in Princeton, Borders in Flemington, Doylestown Books and Siren Records in Doylestown, Pennsylvania and Farley Books in New Hope, Pennsylvania. Panoply Books in Lambertville has graciously offered to do a window display of posters of NZ poets. Phoenix Books here has a couple of poetry posters in their front door. I think people are interested in what happens in New Zealand. After this, I started on the cafes and managed to get really good coverage in the area. Even most franchised cafes and fast food outlets have proper notice boards for posters. In America, a lot of posters are stapled to wooden lamp-posts. A week ago I did the deed and bought an industrial stapler from a really cool, old-school hardware store called Finkles. This store has real character. 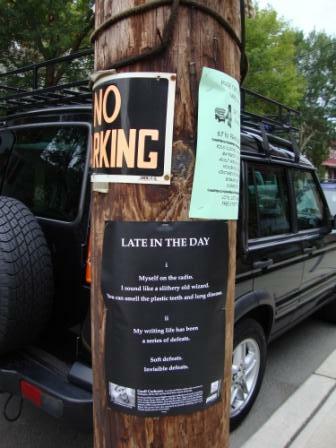 The next morning I stapled up poetry posters on all the main streets around Lambertville. I managed to place the posters on good angles for easy viewing so that no matter where you walk in Lambertville you will see a poem by a New Zealand poet. For years I’ve thought a lot about that notion of NZ artists (of all types) being ‘Stranded in Paradise’ and I think that is not now necessarily so. What a crook sentence eh? I meant it, too. In New York City there is a guy doing something really interesting. When he sees poorly designed posters on lamp-posts, he takes them down and redesigns them. Then he puts the new design (which will work a long way better as a poster) on the same lamp-post. He probably even gives the poster better distribution. This method takes a cue from ‘Guerrilla Gardening”. This past week I took some Janet Frame poetry posters back to Princeton. I placed some on the local postering bollards and then I went to the English Dept (McCosh Hall) at Princeton University. I managed to get excellent coverage through that department. I was delighted to be helping bring our finest writer to America. I call that “Freedom”. It was all just really exciting and I got excellent coverage in the hallways (where posters were displayed) and on the notice boards. Princeton was recently voted the number one University in the USA – first equal with Harvard. This week I am away to Cornish, New Hampshire. I’ll be taking with me poetry posters by Michele Leggott, Hilaire Campbell, and Campbell McKay.